The American Flag Display Box is a very impressive solid wood flag case at a great price. This beautiful case is one of the best selling cases. 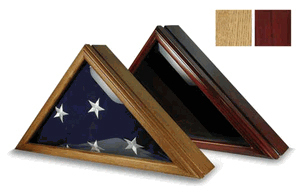 The American Flag Display Box is a very impressive solid wood flag case at a great price. This beautiful case is one of the best selling cases. This flag case is designed to hold a 5ft x 9.5ft flag. Features: Glass front. High quality crafted hinged lid for easy flag insertion. Wall mount included. This case is designed to hold a 5ft x 9.5ft flag.